I thought of my grandmother when I picked up a new lipstick recently. “You could use a little lipstick” was how she often greeted me during my young adult years. She also told me often that I was sweet and smart and talented and, yes, beautiful. Like countless grandparents before and after her time, she would occasionally express befuddlement about the fashions worn by “kids these days,” and she had a habit of pushing my bangs to the side while telling me that these were the only eyes God was going to give me. But I never had any doubt that she loved me just the way I was, so I never felt bad about the lipstick line. She was from a different era and believed that ladies ought to wear lipstick. I recall her pulling out her own tube of lipstick from her handbag and applying it—either a pinkish coral or red color—every time she left the house. She might be wearing a shapeless house dress or no-nonsense slacks with an elastic waistband and a button-down shirt, but she always finished the look with her diamonds and lipstick. My grandmother’s words sunk in and I credit her with making me the lipstick lover I am today. I don’t leave the house without a little something on my lips—tinted balm, gloss, or lipstick. Over the years, I’ve used a lot of colors from more cosmetic lines than I can recall, but I became a wiser consumer and limited my choices upon learning about the damaging chemicals hiding inside most of those lipstick tubes. (If she were still alive, I would replace my grandmother’s lipstick with a safer version. If you’re not aware of what’s in your personal care products, please visit the Campaign for Safe Cosmetics and EWG’s Skin Deep database, which evaluates products and ranks them for safety.) When I felt I could use a little pick-me-up a few weeks ago, treating myself to a new lipstick sounded like a good idea. 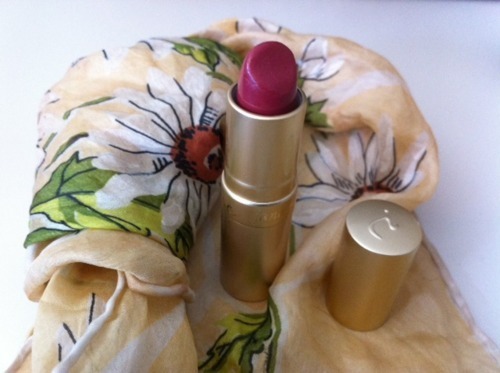 I went with a shiny gold tube of Brett lip colour by Jane Iredale (pictured), one of the cosmetic lines I count on for making high-quality makeup without the harmful chemicals found in so many other brands. It’s creamy and the color works on me as an everyday shade. It feels like the perfect “you could use a little lipstick” choice.